We provide practical work experience for Indigenous university students, particularly those studying accounting, finance, law or business, to complement their tertiary studies. IBA partners with CareerTrackers as well as the Australian Public Service Commission to engage interns and cadets. IBA employs more than 200 people from diverse cultural backgrounds and demographics. Interest and/or experience in the banking and finance sector, policy development or corporate services is often an advantage for an undergraduate position in IBA, while all positions require a strong customer service focus and compliance with IBA’s Code of Conduct, Values and Behaviour Framework. What are some of the benefits of an undergraduate position with IBA? 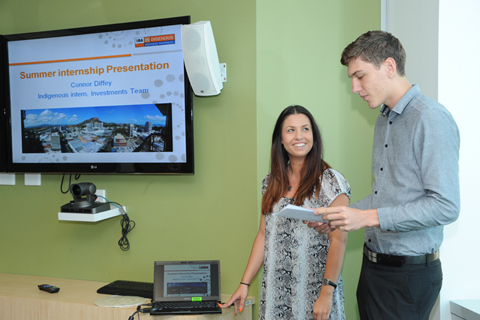 Interns Connor and Breeana sharing insights into their placement with IBA. IBA cadets and interns are given opportunities to develop their tertiary studies within a work environment, and gain valuable experience for a career in IBA or elsewhere. travel and accommodation assistance in certain circumstances. To apply for an internship or cadetship with IBA contact CareerTrackers and list IBA as your preferred employer. Contact IBA’s HR team by email or phone 02 6110 2615.